As the weather cools down, you are likely to find some unwanted pests trying to take shelter in the warmth of your home. When it happens, it can be widespread; you’ll find ants crawling over any surface. While a bug spray might eradicate the ones you see, they will eventually come back. Before you call a pest company like Trusted Pest Management, let’s source where the problem is coming from. Here are the top five places you will likely find those pesky ant nests. If you are seeing lines of ants across your kitchen benches, around the sink, circling the fruit bowl and disappearing into thin air, it may be both reassuring and annoying to know they are not going far at all. Ants that make their way inside en masse, do so to escape the elements of weather, and to source food to sustain their colony. This makes the cabinets and cupboards of the kitchen—be it under the sink, amongst the crockery, or in the pantry—a very convenient camping ground for the groups of ants. They have access to the crumbs you spill while preparing dinner, water you might drip after washing the dishes, and hope to remain undisturbed while you carry on with life above them. With this in mind, the cleaning rituals of the kitchen are given new importance; make sure all food is sealed and put away, spills—particularly food and grease—are cleaned up, and floors are regularly swept. This is a problem that can be solved by installing ant baits around suspected areas, which are fortunately easier to access than some of the other places that ants love to hide. Ants generally favour dark, damp, undisturbed nooks; so if their small bodies are able to find access to the innards of your walls, they will have struck gold. It is most common for ants to find their way into cavities of walls that form the main structure of your home, however particular species of the larger ants, such as yellow ants, can make their way inside the foundations. While they rarely cause structural damage, it does pay to know where such pests might be hiding. If walls aren’t the source of the problem, it might help to look down at your feet. The cracks found in concrete slabs are a breeding ground for ants to make their nests. If possible, experts recommend storing baits under the concrete slabs before this becomes an ongoing problem. Got a deteriorating house with rotted window frames? You may have noticed some ants trying to burrow through the cracks. If this sounds familiar, sprinkle the outside surface with powdered insecticides. This will not only repel the creepy crawlies, but also soak up the extra moisture that is inviting the unwelcome guests. Carpenter ants, (often mistaken for the termite) are those that mostly prefer to make their nests in wall cavities; feeding on wood and sawdust. Some of these ants will also seek out and feed on foam insulation between walls and in ceilings—an action that, over time, can reduce the integrity of the structures. Spray insecticides will work to poison the materials these ants feed on, without corroding the wall. 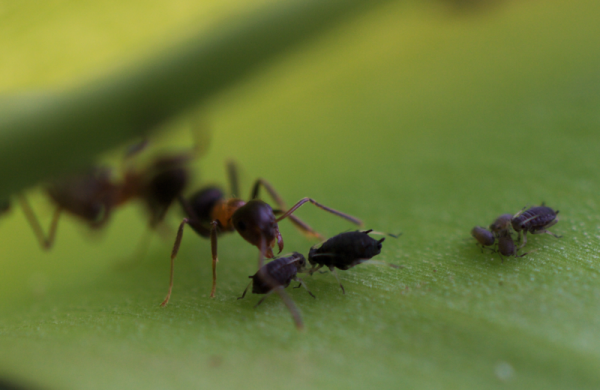 Where are the ants congregating in your home? Do you have any tips for how to get rid of them? Leave your tips in the comments below.